Eastport is a small city (consisting entirely of islands) in Washington County, Maine, United States. The population was 1,331 at the 2010 census. The principal island is Moose Island, which is connected to the mainland by causeway. 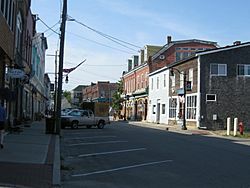 Eastport is the easternmost city in the United States (although the nearby town of Lubec is the easternmost municipality). From 1807 to 1809, the town was a center of extensive two-way smuggling during the Embargo Act imposed by President Thomas Jefferson. In 1809, Fort Sullivan was erected atop a village hill, but it was captured by a British fleet under command of Sir Thomas Hardy on July 11, 1814, during the War of 1812 as part of the initiative to establish the colony of New Ireland. England claimed that Moose Island was on the British side of the international border which had been determined in 1783. Nevertheless, the town was returned to United States' control in 1818. The boundary between the U. S. and Canada in the area remained disputed until settled by the Webster–Ashburton Treaty of 1842. Eastport would be incorporated as a city on March 18, 1893. Farms produced hay and potatoes. Industries included a grain mill, box factory and carding mill. But the island's economy was primarily directed at the sea. With tides of about 25 feet (7.6 m), Eastport's spacious harbor remained ice-free year round. The first sardine factory was built here about 1875. 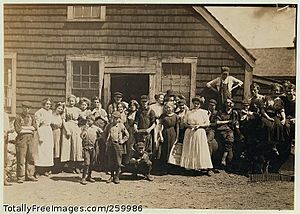 The population grew with the emergence of the sardine fishery and related canning businesses, which studded the shoreline by the end of the 19th century. By 1886, the town contained 13 sardine factories, which operated day and night during the season, and produced approximately 5,000 cases per week. 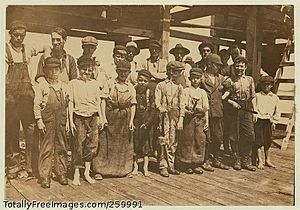 About 800 men, women and children worked in the plants. But the industry would decline, and many people moved away. Indeed, the city went bankrupt in 1937. In 1976, the Groundhog Day Gale destroyed many structures along the waterfront. Today, catching fish remains the principal industry, although tourism has become important as well. Independence Day in Eastport includes "Old Home Week", which is the celebration of the birth of both Canada and the United States. The celebrations traditionally begin on Canada Day and runs through U.S. Independence Day, it is actually a celebration of the birth of two nations. Eastport hosts the largest Fourth of July celebration in Maine. 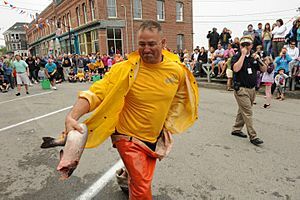 Events include the Grand Independence Parade (with considerable participation of its Canadian neighbors), fireworks over the Bay of Fundy, free entertainment at Overlook Park, greasy pole and water sports, antique car show, and contests and games for all ages with prizes. Since 1905, U.S. Navy and U.S. Coast Guard ships have made a port call over the 4th and provided free tours. According to the United States Census Bureau, the city has a total area of 12.34 square miles (31.96 km2), of which, 3.63 square miles (9.40 km2) is land and 8.71 square miles (22.56 km2) is water. Eastport is located on the southeasterly part of Moose Island, which lies between Cobscook Bay to the west and Passamaquoddy Bay to the east. The city faces Deer Island to the northeast and Campobello Island to the southeast—both in Canada. In the city, the population was spread out with 18.7% under the age of 18, 7.9% from 18 to 24, 23.5% from 25 to 44, 28.5% from 45 to 64, and 21.5% who were 65 years of age or older. The median age was 45 years. For every 100 females there were 89.8 males. For every 100 females age 18 and over, there were 90.0 males. Eastport, Maine Facts for Kids. Kiddle Encyclopedia.